Give the Gift of a "Tatty Teddy" Cute "Me To You" Bear to say I love you, congratulations, happy birthday, send hugs any day, or for special times! Teddy bears are often associated with children and with babies. In part, this is related to their softness and cuteness, and additionally, it has simply become a tradition. They are often seen as being related to comfort. One particular type of teddy bear that is well known is the Tatty Teddy, otherwise known as the Me to You bear. Although these border on being collector’s items as they are small and relatively expensive, they are often associated with messages of kindness, of good meaning and of congratulations. 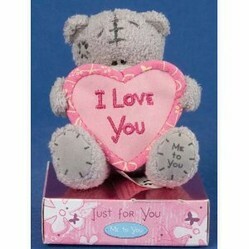 Me to You Tatty Teddy Bear with Heart "I Love You"
Me to You Tatty Teddy Bear 3" (7.62 Cm) Bear with Heart "I Love You"
The story of Tatty Teddy, or the Me to You Bears, is an interesting one. They were originally developed in 1987 from a sketch of the original Tatty Teddy. The range has since been expanded significantly to include cards, figurines, accessories, and of course teddies. The basic design of the bear is having grey short fur, a blue nose and black eyes. In addition, the bear has patches of a lighter grey and visible stitching work. There are many different variations of the Tatty Teddies, including romantic messages, seasonal or event related bears, and ones celebrating the birth of a baby. In addition, there is also a plain Tatty Teddy, and one non-tatty Tatty Teddy, which represents the brown teddy at the start of the Tatty Teddy story. The Tatty Teddy story tells of a normal brown bear that was accidentally thrown into the rubble of a house that was being demolished. He was unnoticed, it began to snow, and this turned his fur grey, and his nose blue. A little girl eventually found the teddy and took him home to patch him up, loving him from first sight. Although the story is short and simple, it is a very sweet tale to explain why the teddies look the way that they do. One of the Tatty Teddy Bears is the six-inch congratulations cake bear. The bear has the old style of fur, which is long and is not used in many of the current generation of Tatty Teddies. The bear is sitting down, holding a cake with a Happy Birthday banner. Another bear is the three-inch bear hugs Tatty Teddy. This bear is simply wearing a red t-shirt with a heart and the word ‘hugs’. He is much smaller than most of the Tatty Teddy Bears, and as a consequence, looks a little different. Another bear is the Musical bear, who wears a blue tie covered in musical notes. This one is eight-inches in size. These three teddies represent the most common sizes for Tatty Teddy bears, although others do exist. The Tatty Teddy range is an interesting collection of bears that cover a range of occasions, and make good gifts. Care should be taken with them around young children or babies, as they are small, and parts can break off. Some bears are produced only seasonally, or for special occasions, and in limited numbers. In this way, they are similar to Beanie Babies, who likewise have many variations, some of which are seasonal, or limited in distribution. ethelsmith, me too! I was given a teddy bear after I gave birth. thanks for your comment!